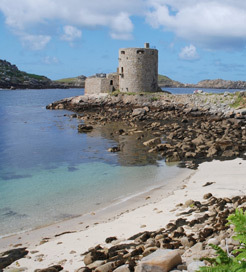 The Isles of Scilly are a British archipelago sitting just off the southwestern tip of the Cornish peninsula. Commonly known as the ‘Scillies’, they’re in a beautiful world of their own, away from the bustling mainland. Traffic, supermarkets and hotel complexes don’t exist here. They also have one of the mildest climates in the United Kingdom, with warmer winters and more hours of sunshine than south-west England. The five inhabited islands are St Mary’s, Tresco, Bryher, St Martin’s and St Agnes, with a further one hundred or so uninhabited islets strung across the bays. The Scillies make an ideal slow-paced weekend getaway, boasting plenty of sublime Mediterranean-style beaches. The most picturesque can be found on St Martin’s, where you can try snorkelling with playful seals. St Martin’s is also home to the smallest and most southerly vineyard in the UK, with recently planted pinot noir and chardonnay vines. The stunning Tresco Abbey Garden was created in 1843 and is a must see for any horticulturist. On a stroll through the gardens, you’ll spot over twenty thousand exotic plant species including desert cacti and crimson flame trees. St Mary’s is the largest and most visited of the Scillies. It has a well-preserved Bronze Age tomb or ‘entrance grave’ known as Bant’s Carn and an Ancient Roman settlement at the foot of the hill. In the summer months, be on the on the lookout for the local ‘gig race’. This is a wonderful spectacle involving crews of six rowing a boat known as a ‘gig’, between the main islands. You can sail from Penzance in Cornwall and arrive in St Mary’s within three hours. The journey itself is a great opportunity to spot dolphins and to drink in the beautiful scenery. The service is run every day, with 'Isles of Scilly Travel' ferries fully equipped with cafés and comfortable seating. For more information, please visit our Ferries from England to Isles of Scilly page.